Remember my post about the new Farm-to-Table menu at Crossroads Restaurant at the Radisson Hotel in Cross Keys? Well now in the Crossroads Lounge they have another new event that they shared with me – Wine Wednesdays, a continued event that will support Maryland wineries each Wednesday from 6:30-8PM! The first event is on December 2nd and features Basignani Winery. These Basignani wines will be available for tasting: the 2007 Piccolo (a 50/50 blend of Cabernet Sauvignon and Merlot), 2007 Chardonnay and 2007 Riesling. As well as wine, there will also be samples of appetizers from Crossroads Restaurant. There will be the opportunity to buy wines by the glass or bottle. And p.s., did you know about a new Maryland law that allows unfinished bottles to be taken home as long as they are corked and bagged? I had no idea! Bring on more BYOB’s!!!! A couple of years ago I helped harvest grapes at Basignani one October weekend. Ever since then I feel that I have a special connection with the winery, and indeed I sort of do – I helped bring along the production of Elena (a white wine) that year! This event is free and open to the public, December 2nd, 6:30-8PM - Drop in when you can and stay as long as you want. The next Wine Wednesday is Dec 16th and will feature Woodhall Wine Cellars. Finally I went to Attman's Deli! Attman's Deli is a foodie institution in Baltimore, and it slightly pained me I had never treated myself to a lunch from there. Treat is the correct word because a sandwich can cost around $10 at this place. But is it worth it? I opted for the Nosh on Rye ($9.99) - corned beef, brisket, swiss cheese, Russian dressing and coleslaw on rye. This knocked the socks off my taste buds. It also kept me incredibly full the whole day, so maybe $10 for a sandwich is worth it! 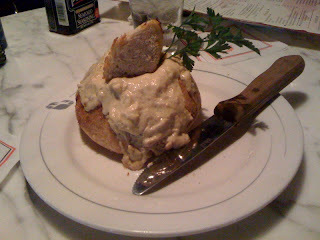 I loved the crunch of the cabbage and the sweetness of the Russian dressing which complemented the savory rye. The meat was perfectly tender and just piled high, as you can see by the picture, they definitely don't hold back. This was a great first sandwich. My friend tried their cinnamon roll, pictured above, that was flaky and peppered throughout with sweet and plump raisins. This was delicious. It was also quite big, as most of the servings are at this place. Here's the downside of Attman's - it's loud, busy, and confusing. I urge you to place your orders online, via fax or on the phone and if you did the first two, ALWAYS call to check and see if your order was received. If you do those things, it's smooth sailing. Of course that's after you've spent 40 minutes trying to decide what you're going to order! Living in Baltimore for as long as I have, I have always been familiar with Philip's. However, for some reason I thought of it only as a tourist restaurant, a place in the Inner Harbor for visitors to go, and locals to pass by.......but I wasn't entirely sure why. So when I was contacted by Philip's recently for an invitation to their restaurant, I very humbly accepted. And the fact is, I was very VERY pleasantly surprised. The food was delicious. The manager then surprised us with a smaller version of their chilled plate which featured oysters, clams, jumbo lump crab meat (a very generous amount too! 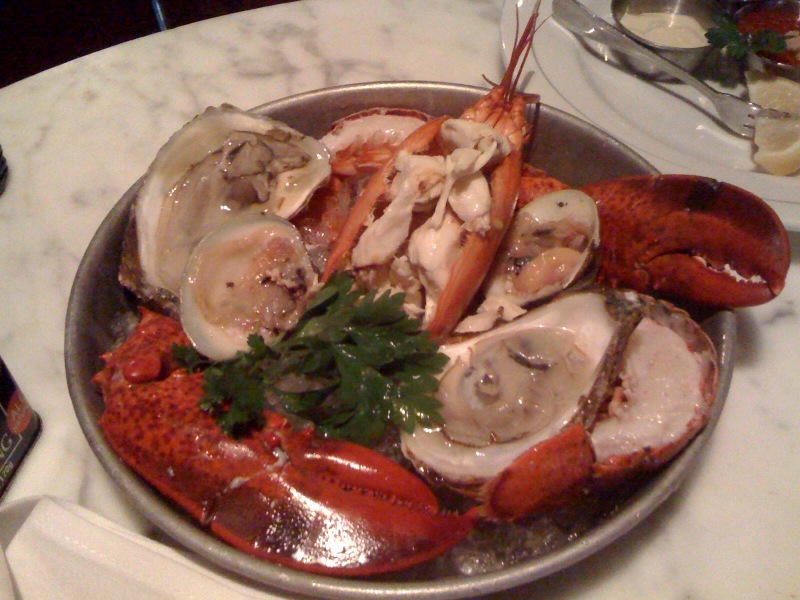 ), a lobster tail, and lobster claw meat. This led me to like oysters again, and also rediscover my love for lobster - wowee that meat is good! It is served with three different sauces: shallot vinegar, mustard, and cocktail sauce. This is something I would never have ordered, not merely because of the price, but because I usually go for cooked/prepared dishes. But what was great about this dish, other than pulling me out of my comfort zone, was that everything tasted so fresh, and I guess that's the point, right? Also, I must say, the presentation was excellent. Unfortunately, we had already ordered our meal when our surprise Chilled Plate arrived, so when our actual meal came out - not only were we getting full, but we were also ridiculously embarrassed about how much food we were attempting to eat. But for the sake of this blog, we soldiered on! We tried the New York Strip Steak which came with broccolini and a potato hash on the side ($34.99). Cooked medium rare, as ordered, it was juicy and perfectly tender with just the right amount of pink. Slicing through this meat was so easy - what an excellent cut of beef! The yukon hash was mixed with green beans and was a crunchy side to the steak, the broccolini was good, but plain. It is also important to note that the sides came with this meal, otherwise the a la carte sides are anywhere from $5-7. 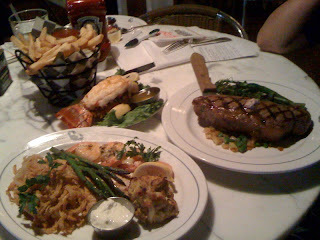 The a la carte Lobster ($15) was an amazing addition to the steak as well. ...the French Fries with Market Sauce ($4.99)!!!!! I personally did not like the tangy market sauce, but the fries were perfection! The were crispy and yet soft and well salted. And what a large portion! It's definitely worth the price. But this serves an important lesson: always ask your server if the meal comes with anything else, even if it's not listed on the menu. 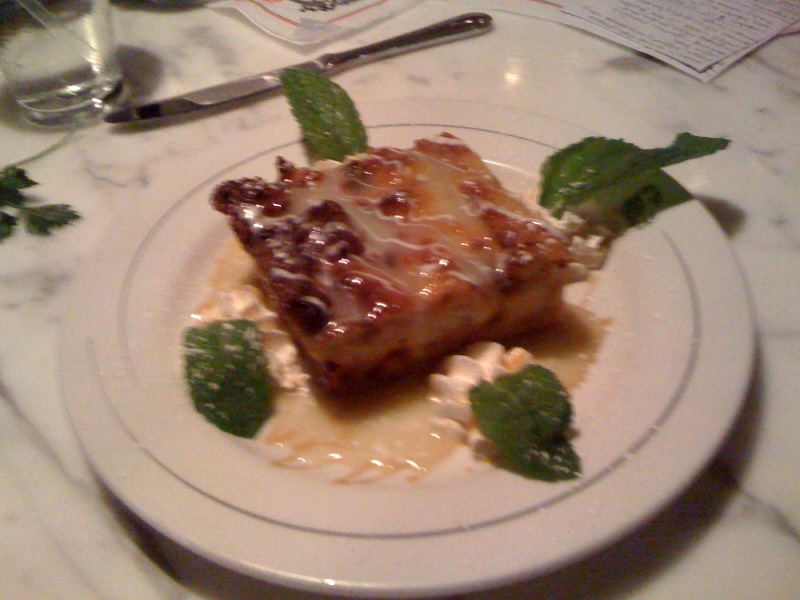 At this point I was about to explode, but Dan LOVES bread pudding, and we found out that the bread pudding is one of the dishes they make in-house, so we decided to unbutton our pants and try it :) The bread pudding had a vanilla icing glaze with cinnamon chips and was served warm. I wasn't that into this dessert, it was much too sweet for my taste, but Dan loved it. Thaw spinach in refrigerator overnight or in microwave approx. 2 minutes, depending on microwave. Press spinach in fine mesh strainer until as much liquid as possible is squeezed out to yield about 1 c. chopped spinach. Set aside. Heat sour cream, cream cheese, Parmesan (reserve 2 tbsp. aside for topping) and Gouda in 2 qt. saucepot over medium low heat, stirring constantly, until heated through and well blended. Do not boil. Stir in spinach until thoroughly mixed in. Remove pot from heat and gently fold in crab meat. Turn mixture into 2 qt. heatproof casserole or soufflé dish, top with reserved Parmesan and bake 15-20 minutes or until bubbly and cheese is golden brown. Serving suggestion: Serve with assorted cracker breads or slices of toasted garlic French bread. For an individual appetizer idea, portion dip into 8 -4 oz. ramekins to bake and serve with breads or assorted fresh crudités, such as red pepper strips and carrots. Have you ever been to Philip's? Let me know what you think in the comments! DISCLAIMER: Philip's generously paid for my entire meal, but they did not request me to write favorably about their meal as an exchange, nor did I feel any requirement to do so. As mentioned in an earlier post, I love Cypriana's pit stand, but I hadn't been to the actual restaurant in a while, so I finally decided to make an appearance. I ordered a gyro ($6.90), obviously, and devoured that sandwich happily. This is a good gyro, hefty too. You don't need a side with this. One thing you do need? Napkins. Actually, you need a huge wad of them because I got pretty messy eating this. I also tried a bite of my friend's hummus - and it was lovely and creamy. I would definitely come here again. Tony Geraci, director of food services for Baltimore City Public Schools, has been getting a lot of publicity lately. He’s been featured in The Atlantic, the once Gourmet Magazine, NPR and many other media outlets to talk about Great Kids Farm. Great Kids Farm in Catonsville provides produce to city schools, in the hopes that the kids will learn more about locally grown and sustainable food. Not to mention it will start to teach them about making healthy choices! Mr. Geraci will speak at Park School about the farm and his aim to revolutionize school lunches, as well as simply teaching kids about the basics of food. On top of that, the event will include tastings and recipes – something we all love!!!! I am so excited to share that I FINALLY went to Trinacria the other day, and oh boy was I a happy camper!!!!!!! I loved admiring all the different Italian delights, especially the pasta, sauce and cookies. 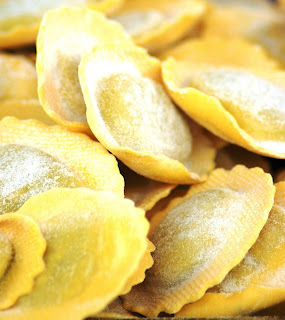 But the frozen food in the back is what really caught me eye – especially their own raviolis! I bought some butternut squash ravioli to try, and they were fabulous. The squash taste wasn’t strong at all, yet it still had a cheesy filling and it went well with a butter sage sauce I made. They also have some frozen Italian meals that were reasonably priced and looked super yummy. I tried the mozzarella sandwich which came on foccacia (also fresh) with pesto, lettuce, tomato and the freshest mozzarella ever! This sandwich was quite large, and I could have easily saved half for later, but it was TOO GOOD. Also, in hindsight that was a good idea because the tomato slices may have made the bread soggy. I also bought some fresh bread that was out of this WORLD!!!!!!!!!!!!!!!!! This place is a GEM. I cannot wait to try all the other delightful offerings they have, especially their prepared foods. I went to India Palace the other day for dinner, which is very unusual since I mostly frequent their buffet. I love their buffet because their choices are always so different each time you go. As I mentioned in my last post, they change up their buffet options all the time - which is great! Going to dinner allowed me to try my favorite dish, the Chicken Korma, which is usually not on the buffet menu. This dish is just spectacular. It really and truly is. The creamy, slightly sweet sauce is heavenly, and although I eat it with rice, there's something so satisfying in scooping up the sauce with their fresh naan. Oh, this is truly a treat. I would definitely urge you to try it! The Shrimp Biryani (rice dish) was a bit spicy for my taste, and I needed to eat it with raaita (yogurt sauce) in order to soften the spice-blow. However, there's just something about biryani - where ever I go, it never EVER manages to equal my mum's version, therefore I usually refuse to order it when I go out. I am not one to judge this one - Dan liked it, but thought it was a bit too spicy as well. For a vegetarian dish, the Aloo Gobhi (potato and cauliflower) was incredibly flavorful and chock full of vegetables. This is fabulous with naan. Sorry it's been so long since my last post! I have lots of goodies to share with you, please just bare with me!!!!! Have a Wonderful Weekend Baltimore! I'm going to meet up with some friends, shop for our house, sing in my choir, watch some football and hang out with my husband. I became a fan of Edible Arrangements on Facebook, and to thank me they sent me a coupon for a free box of chocolate covered fruit (usual price is $15). Awesome! I picked up my free box at the Lutherville store and went home to devour them. 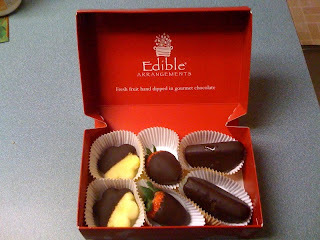 My box had 2 pineapple pieces, 2 strawberries and 2 apple segments covered with semi-sweet chocolate. And the verdict? They were good. Surprisingly good, especially considering pineapple and strawberries are not really in season right now. And yet, they were deliciously ripe and had a perfect amount of sweetness that contracted well with the semi-sweet chocolate coating. However, let's be honest here. $15? $15 for 6 pieces of fruit covered with a coating that I could whip up myself if I had some chocolate chips + 30 secs in the microwave? Seems too steep for me. And although I think it's awesome that they offer incredibly ripe fruit, it almost seems too incredible. Too unreal. It makes my mind start wondering about possible additives/chemicals that are involved in keeping the fruit fresh and sweet. I am very thankful to try the product - what a great coupon! However, I can't justify buying this box of fruit, especially knowing I can easily make it myself. Is anyone here a big Edible Arrangements fan? Am I missing something? Since I had such a positive experience the last time I went to Bahama Breeze, I wanted to see what else was yummy. I decided to try the Seafood Paella which comes with assorted seafood, chicken, sausage and peas with yellow rice. In all honesty, I couldn't remember if I had even had paella before, so I couldn't compare it with anything. It was good, but definitely didn't have a complex flavor - there was a strong tomato taste, and that's about it. The amount of seafood was quite incredible, and definitely unexpected. I didn't think the chicken was necessary at all, and didn't really add anything to the dish. I know it doesn't sound as if I liked it, but I did, I am just not sure if I would order it again. Dan ordered the West Indies Ribs that came with a guava barbecue sauce. We both agreed that there wasn't anything special about them, and the guava sauce was much too sweet anyway. On a more positive note, we tried the yuca fries and I was obsessed. They are very similar to home fries, but much much crispier. I loved them as a fun little snack - definitely try them if you can! They come as a side to the Wood-Grilled Top Sirloin Steak. Check out the review from my first trip to Bahama Breeze for a more positive review :) I definitely think I would order the salmon with mango-butter sauce if I were to go again. I had heard good things about Mango and Coconut's (located within the Charles Street Shopping Center) Jamaican food, so I happily checked it out for lunch. I ordered the Curry Chicken with rice and beans and a side of plantains. My friend ordered the Brown Stew Chicken with the same sides. The Curry Chicken at first bit was incredibly flavorful and heavily spiced. And then , all of a sudden the sauce sneaks up on you and your mouth is one fire (granted, I have a VERY low tolerance for spicy foods). The heat wasn't so bad that I didn't enjoy it, though, especially since the rice and beans were a perfect accompaniment to the sauce. Despite the spice, I enjoyed this meal thoroughly. It's a warm and comforting meal, perfect for a cold day. The plantains were good and sweet, though nothing to write home about. On the opposite spectrum, the Brown Stew Chicken - what does Brown Stew even mean? - was a delightfully savory and non-spicy sauce that soaked right into the meat of the chicken. Which brings me to another point - in both dishes, the chicken was incredibly moist and came right off the bone. So, if you are new to Jamaican cuisine, or you aren't a fan of spice - start with the Brown Stew chicken . And if you love the burn - try the Curry! I'm excited to try other dishes from this place - my next choice is going to be their jerk chicken, I can't wait! And perhaps I'll also choose a smoothie, especially if they are known as a juice bar! Crossroads Restaurant, at the Radisson Hotel at Cross Keys, recently announced their new farm-to-table menu. The menu features seasonal items from local growers, and makes up more than half of the Crossroads menu – which is really great! I personally love when I see menu items from local farms – and I believe other people do too. I think it can really add to a restaurant's popularity, like Woodberry Kitchen or Abbey Burger Bistro. Crossroads offers a Village Trio lunch dish for $11.95 which is a combination of the daily soup special, daily sandwich special and a salad. Super healthy and satisfying, I am sure! Farms and local businesses represented include: Ham from Kunzler and Company; ground beef from Albright Farms’ grass fed, free range cows (yay! ); homemade pastas from The Great Cheese; Stone Mill Bakery’s fresh baked goods and breads; organic greens and produce from Earthbound Farms; specialty Chevre goat cheese from Cherry Glen Farm; and, organic and rich cheeses fromHawks Hill Creamery. If you end up going, let me know what you think! There's also a Crossroads Lounge that offers free live jazz on Thursdays, 6-9PM. 7 of my friends wanted to meet in an affordable City establishment for some dinner and drinks. Some of them were from out of town, so the Baltimoreans were asked to come up with the meeting place. Easy enough, right? Especially when there's a food blogger in the midst! I destroyed all of my Foodie credibility. Let's be honest, anyone who has ever been to Pub Dog knows that it's not the place for a group dinner centered around conversation and catching up. We had to take up two tables (of the four) in the back, and by the end of the night my voice was hoarse from shouting in order to be heard by my neighbor. This is a bar. A bar that just happens to serve pizzas. This is not a restaurant where you can hang out and chat. The food itself was decent, nothing spectacular. I ordered the Spinach Pizza ($8.50), without bacon, which was heavy on the cheese (good) and salt (not good). I tried the Veggie Dog Pizza ($8.50) which had an ample amount of veggies (good) coupled with an ample amount of Soggy Crust Syndrome (not good). The BBQ Chicken pizza ($9) was flavorful and sweet, though personally a tad too sweet for me to have more than a slice. Since the place is also known for its beers, I tried a couple of those too (beware - you have to buy 2 of the same kind for $4, which works well in groups, but not so well for a couple, perhaps). Both beers (Raspberry and White) were light and pleasant, though definitely more summer beers. The fruit flavored beers are not overwhelming, which can be a good or bad thing depending on your preference. I personally liked them a lot. Overall, I can see the appeal of Pub Dog if you live close by and want a neighborhood bar that has good pizza. But I definitely would NEVER recommend for a group dinner. 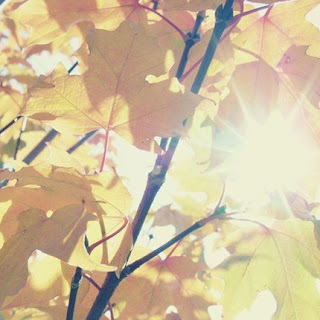 I want to apologize if you have sent me an email and I've never replied - I LOVE LOVE LOVE email, I ALWAYS write back. So If I never wrote back....now you know what happened! What upsets me the most is that I may have missed people's entries into my giveaways. Was it just us, or was there a short supply of trick-or-treaters on Saturday? My husband and I bought SO MUCH CANDY, and we probably only had 5-6 kids show up. I was ridiculously upset! I love seeing little kids in costume!!!!!! This was the first Halloween we spent in our new house, so now we are nervous that this is what it's going to be like every year!!!! But maybe it was just because of the rain? Either way, we have a TON of Kit Kats and Snickers lying around the house - NOT GOOD. Luckily we had plans later at night, so our evening wasn't a complete bust. I went as Hermione Granger from Harry Potter, what about you?